What Content Gets Shared The Most? Few things spike the anxiety needle like having to talk before a crowd. Typically, however, fear of public speaking is a result of not adequately preparing for your presentation. Here are several steps you can take to calm your nerves and build your confidence. Don’t wing it. Write your speech—or at least, an outline—ahead of time. Then get comfortable with your material. Rehearse it, standing, sitting, arms spread wide. If you can, record yourself. Toastmasters is a group dedicated to public speaking. Groups gather regularly during lunch or after work to help polish their skills. VirtualSpeech – This app lets you practice in front of a realistic virtual audience. Begin the app and insert your phone into a VR headset and now, you can present to anything from a boardroom to a TED talk audience. That’s the way to get your head in the game. HiveBrain Software – HiveBrain takes a different approach than VirtualSpeech. The app targets speaker anxieties. Instead of practicing your actual speech, HiveBrain has you “hack” your brain via self-hypnosis and relaxation techniques. Confident Public Speaking – If your problem is stress, here’s an app that will help you relax. The app includes guided meditations to help you stay calm. Prompster Pro – If you’re afraid of forgetting what you are going to say, Prompster is an app that turns a smartphone or tablet into a teleprompter so you no longer have to fumble with notecards or a faulty memory. Studies show that audiences are often more receptive to an enthusiastic speech than an eloquent one. So drink a triple latte or blast some tunes before presenting. Whatever gets your energy up. Attend the sessions of those who present before you. That way, you can feel out the audience, gauge their mood, and adjust your tactics and humor accordingly. Give yourself plenty of time to arrive at the venue, settle in, and do any last-minute preparation before your talk. Easing into your moment makes a huge difference. The more familiar you are with your surroundings, the more comfortable you’ll feel. Spend time in the room where you’ll be presenting. And practice there if you can. Chat with people before you jump on stage. Talking with attendees makes you more comfortable with them, and vice versa. Visualize your talk. Studies show it’s an effective tool. Imagine yourself with poise and charm. Imagine the audience nodding and laughing. One of the most tried-and-true ways to calm jitters is to take deep breaths. Nerves make our muscles tighten. So inhale, exhale, and relax your body. Smiling elevates your endorphin level. It makes you feel better. It also projects confidence. Here’s another way to boost endorphins—exercise. Working out prior to your presentation eases pent up anxiety. When we’re nervous, we often talk fast, then get even more nervous. Slow down and punctuate your talk with pauses. It lets your audience relax and helps you keep your cool. Body language speaks louder than words. It also affects your state of mind. Stand in a confident way before hopping on stage, and your mind will follow. We’re talking about water. Anxiety often causes cottonmouth. So keep a bottle of water handy, before and during your talk. 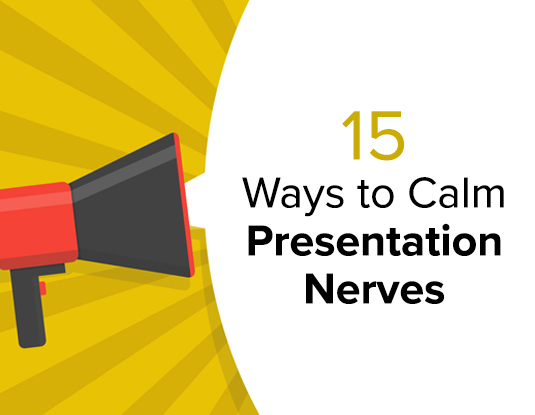 Based on 15 Ways to Calm Your Nerves Before a Big Presentation by Larry Kim.